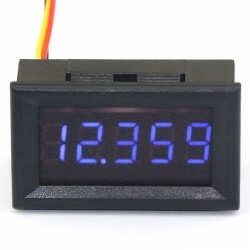 It is a Ultra-high Measurement Precision Three Wire Red/Blue/Green LED Digital Voltmeter, Power S.. It is a 2in1 Volt Amp Panel Meter, Measure Voltage Range DC 4.5-30V,Measure Current Range:0-5A fo.. 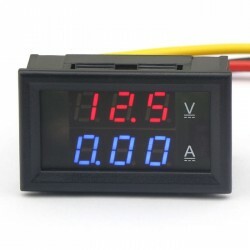 It is a Digital Voltmeter/Panel Meter/Monitor/Tester, Measuring Voltage Range: DC 0~99.9V, Power .. It is Alligator Clips/Crocodile Clamps, Rated current: 10A, Thickness of clip: 0.5mm or so. Mainl.. 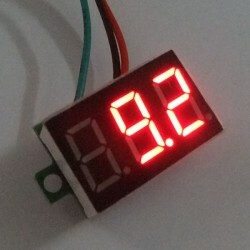 It is a Red Green Dual LED Voltmeter Ammeter,Supply voltage: DC 3.5-28V,Measurement range: DC 0-999.9mA-3.000A(current); 0.00-33.00V(voltage),Measurement accuracy: ± (0.3% + 2 digits). 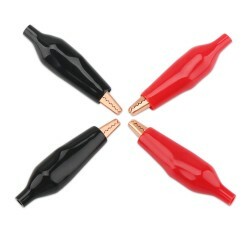 1,When the system load is bigger, there will be some certain voltage drop on the connecting wire. so the meter will not properly display the output voltage of the power supply system. now the voltage compensation function can solve this problem by moderate compensation of the voltage loss on connecting wire. 2,When you use this function, first please prepare an at least 4.5 digit multimeter. then connect it to the output of the system supply power, and shut down the power of the voltage current meter. then keeping press the button on the back of the voltage current meter and power to the meter at the same time. 3,Now the below digital tube will display [**]; ** , this indicate the storage compensation voltage level (when the meter was just produced, (when the meter was just produced, the level is 00, display , meaning no compensation). 4,When you loose the button, the below digital tube will display --**, this indicate that the meter is going in the state of setting compensation voltage. please connect the bigger load in the circuit( we advise the current of the load should be higher than 2A, so the voltage compensation will be more precise.) ,then check the voltage which the above digital tube show. press shortly the button one time, it will be automatically added 1 level (The maximum compensation level is 99), until the voltage on the meter is the same to the voltage on the multimeter. 5,Keeping press the button more than 2s to store the voltage compensation. so you will measure the voltage by this compensation level. If you want to shunt down the compensation, please adjust level to 00.